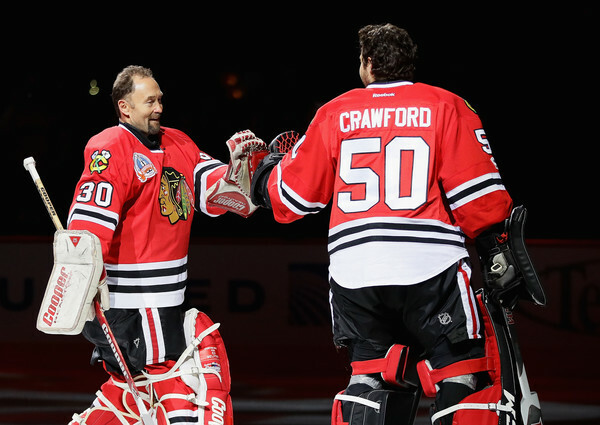 On Thursday night, Eddie “The Eagle” Belfour was welcomed back to the ice in Chicago. The Hall of Famer was the latest part of the Hawks’ “One More Shift” promotion. In 1990-91, Belfour had one of the great rookie seasons in NHL history. He won the Calder Trophy, the Vezina Trophy and the William Jennings Trophy in his first NHL season. He won the Vezina and Jennings Trophies again for the 1992-93 season. Belfour won 201 games in the Indian Head and posted 30 shutouts. He was passed by Corey Crawford for third in franchise history in wins this season and he still ranks fourth in shutouts. My favorite Hawks over the past 35 years include Espo, Savard, Wilson and Belfour. I just loved Eddie the Eagle in goal. Sad when he left. Unbelievably sad to remember that both Hasek and Belfour were with the Blackhawks at one time. Oh the miscalculations of Dollar Bill Wirtz and his inseparable lacky Bob Pulford. If I remember correctly, Keenan played a part in trading Hasek. He really wanted Ruutu, whom they got for Beauregard a few days after the trade. They also got a 4th rounder that turned out to be Daze…. and let’s not talk about the Roenick trade. The Sharks through in a bag of pucks ,.,.to sweeten the deal .